rather fed up with a seemingly endless series of training shoes and the like, none of which seemed to last the distance, i rather fancied smartening up my feet by clothing them in a pair of brown brogues. however, being one of those ultra cool guys who would obviously seem far more at ease in a pair of converse all-stars or old-skool vans, the idea of becoming respectable as my late father would have described it, took a great deal of procrastination to absorb into a carefully cultivated persona. then mrs washingmachinepost was kind enough to present me with a pair of tan brogues for my christmas last year, and the decision was effectively taken out my hands (or feet). it would be naive of me to deny that these are also rather cool in their particular way, but the intention had initially been to keep them for special events only. that way whenever social pressure required me to be smart, at least there would be somewhere to start. however, what was intended as a brief period of familiarity, designed to prevent sore tootsies at those times of need, turned into a far longer term of acclimatisation. in fact, there has barely been a day when i have not worn them since last christmas. to this degree, they have been put through the wringer; worn while hoovering the grass, fixing the bike, walking to the office, sitting on the bus to london and a whole host of other trials and tribulations that neither they nor i were expecting. because that's what shoes are for, particularly comfortable shoes. and to add icing to my delight, they have already lasted considerably longer than my last pair of converse. however, they have not suffered the iniquities offered by the late summer undergrowth inhabiting bridgend woods, aided and abetted by the amateur incompetencies of the would-be cyclocrosser. by comparison, road-cleated shoes hardly know they're born. click in on leaving the house, click out at the coffee stop, then click in once again for the homeward trip. no real scuffing opportunities and no impending demands to run breathlessly up a rocky and rutted path midst the trees. that's what offroad shoes are for. 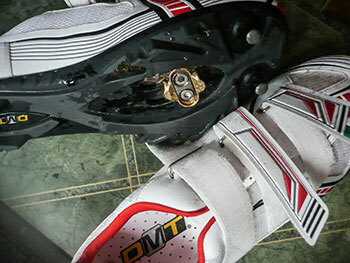 at this point, it becomes necessary to consider semantic definition, for the box containing a pristine pair of dmt marathon 2.0 offroad shoes has a distinct flavour leaning towards mountain biking. naturally enough, the thought of riding a sprung farm-gate was furthest from my mind, for cyclocross season is more or less upon us, and the champions were for more refined rural purposes. even though i have a well-specced 'cross bike and my rudimentary techniques have been honed to a greater degree than exhibited last year, i would doubt i have truly passed the 'beginner' stage. and i'm pretty sure jeremy powers would agree. the dmt marathons seemed thus the ideal footwear. however, i think that dmt sell themselves a bit short. though the uppers appear to be made of synthetic material, offering a tad more dots and dashes than i think truly necessary, the adjustable fit enabled by three velcro straps is quite impressive. the width is perhaps a smidgeon on the generous side, evidenced by a noticeable folding of the upper just below the middle strap. pulling this tighter had no real effect, but in mitigation, there were truly no adverse effects in the process of getting down and getting dirty. the insole is a particularly comfortable affair, whether attempting to run or making life hard with energetic pedalling. the sole gave absolutely no cause for concern, offering decent grip on hardpack with rocky lumps, grass or mud. the upper is a wee bit less rigid than i'd prefer when performing my very own version of a 'cross dismount, but even had i been racing (perish the thought), given that the champions are aimed at the beginner, no complaining can be reasonably tolerated. as a self-confessed ten-stone weakling, i'm aware that i cannot offer the same degree of power input as sven or zdenek, but i had a darned good try. disappointingly they did exactly as they were bid, offering no word of complaint and leaving me as svelte and respectable as a pair of tan coloured brogues. at the end of term, usually written at the foot of my report card was 'must try harder'. nothing's changed. i'm never too sure why offroad shoes feature perforated panels on the upper; offroad is more than likely to incorporate at least one or two patches of muddy water. maybe considerably more as winter beckons. even running through rain-soaked undergrowth leaves the honed athlete with wet feet. surely there is a less invasive method of ventilation? with road footwear reaching ever more stratospheric price points, and incorporating as much carbon fibre as boeing will allow, it is rather refreshing that a highly competent box of footwear can be had for considerably less than £100. 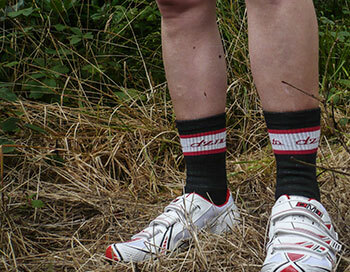 if you're contemplating a forthcoming season of cyclocross but spent all your money on the bicycle (and who hasn't?) 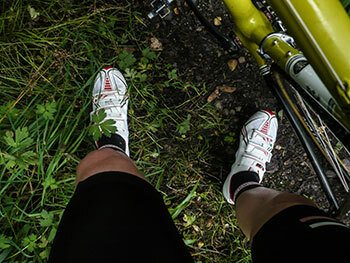 ease yourself into the competitive (or non-competitive) slipstream with these economically priced and brightly coloured offroad shoes. 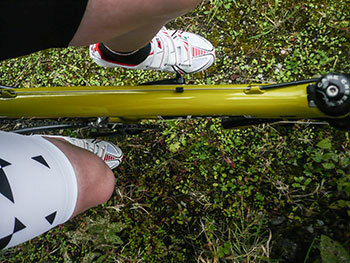 yes, it has been pointed out that white is hardly the most suitable colour midst muddy puddles, but i've adopted an insouciant, devil-may-care attitude, because on the occasions when they're still white(ish) with coloured bits, they don't half look pro. 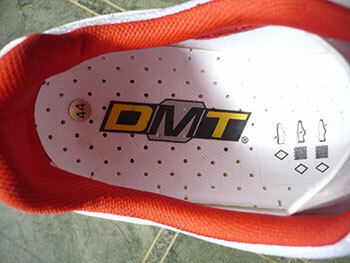 the dmt marathon 2.0 offroad shoes retail at a cost of £75, available in white but with various coloured highlights. sizing ranges from euro 37 to 48 (size 44 reviewed). dmt are distributed in the uk by paligap.